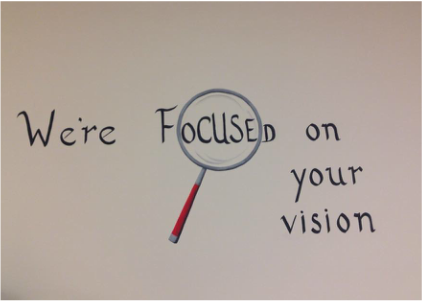 At Eyecare of Florence, our goal is to promote good eye health and enable you to have the clearest vision possible. We accept several types of vision insurance, cash, checks, and most credit cards. If you require a breakdown of costs, please let us know. We participate with VSP, Physicians Eyecare Plan, SC State Health/Eyemed. Vision Care, VBA . We also take Mcleod Regional Medical Center employees and Carolinas Hospital Systems employees' Vision Insurance. Businesses that we accept Vision Insurance for are...Duke Energy, Pee Dee Electric, McKesson, Rock Tenn, Best Buy, ADP, Adams Outdoor, BB&T, Carolina Bank, and many others. Call to see if we accept your Vision Plan. With most plans there is a co-pay for the exam, eyeglasses and contact lenses and fittings. ***We are not set up to take any major medical insurance or Medicare and Medicaid. Vision Insurance is different from Major Medical Plans. Major Medical Plans do not routinely cover Vision Exams. Major Medical Plans do cover eye health conditions such as eye infections, Conjunctivitus and foreign body related conditions. We accept cash, personal checks, debit cards, Master Card, Visa, and Care Credit.To find out more about CareCredit and to apply, click here. Contact our office at (843) 665-2080 to find out if your insurance provider is accepted in our office or for more information about your vision coverage. Our Florence optometry staff understands that cost is a concern when evaluating vision care providers. We do not want cost to be an obstacle to maintaining proper eye health and good vision. We accept various forms of payment. Call (843) 665-2080 today to schedule your eye exam today.